Don't Go Breaking My Heart! Report by Mishi D. Morath. It was a brave bunch of 'Rabblers' that turned up for what was going to be nothing other than a heavy defeat against Watford, who are one of the strongest, and certainly one of the friendliest teams in internet football. We didn't want our hearts broken, as Watford fan sang with Kiki Dee, but break them they did with our heaviest defeat for over a decade. There were no selection problems for our management, it a simple case of if you have your boots you're in, as we had a bare minimum sqaud of a dozen! 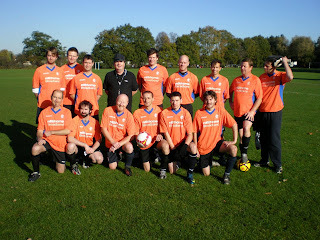 The squad, for the record, was Matt Hammond; Mick O'Shaughnessy; Steve Rickerby; Shaun Dooley; John Prendergast; Mark Hutton; Mishi Morath; Phil Doyle; Darren Nicholas; Trevor Owen; Matthew Virgo & Chris Garrett. It really was a case of 'damage limitation', & against all odds, 'The Rabblers' fought an amazing rearguard action for the first fifteen minutes or so, and although I have misplaced my brief notes from the game, I do recall trying to make a note of the first few goals, to use as my lottery numbers that night, but gave up after the seventh went in! I think we were a 'mere' eight behind at half time! But we weren't torn apart by a single player, two Watford lads got hat-tricks, with a total of no less than NINE of their squad getting on the scoresheet, the most delighted being a defender, Phil McBride, who scored his first goal for them, in nearly a hundred appearances, so he certainly won't forget Dulwich Hamlet! 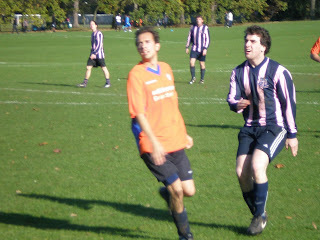 Our chances were few and far between, the closest before we scored, was an effort from Matthew Virgo, that hit the bar. We were thirteen behind, I think, before we pulled anything back. Our two goals coming from Chris Garrett, the latter being sheer quality, hit from the edge of the area into the back of the net! It's hard to single out any particular incident, or the effort of one player over another, everyone gave their all & what more can you ask? But I can't finish without mentioning a superb goal line clearance as the 'Gaffer' Mick O'Shaughnessy turned back the years & headed over a certain goal, that he flicked over the crossbar. True Matt Hammond pulled off a number of fine saves, but I'd like to think that this was the one incident in the game that prevented a new record loss! Fair play to Watford, despite being in almost total control, they never 'showboated' or 'gave it large', well apart from the aforementioned defender after his 'virgin' goal, but you can't begrudge him that! Never flash, never patronising, they simply appreciated the fact we never gave up, despite being second best. 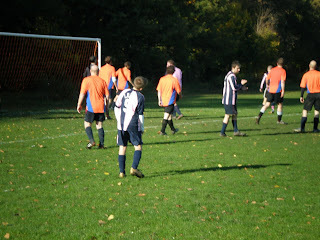 After the final whistle the general opinion of our team members who had played in the ten nil debacle against Ladywell three weeks before, was that if we had played like this against them htere is no way we would have lost. So comfort can be taken out of this huge loss, spurred on by the incentive from the Gaffer, who said that hec wouldn't forget those who took part this morning, & that everyone who did would get preferential treatment up in Glasgow, on the spring Queens Park tour! No luck against the Ladyboys! Report kindly supplied by Guy Grater. 'The Rabblers' played their old foes the Lady boys in a friendly match at Belair Park on Saturday The Home squad contained two guest players from Finland (Sampsa Hirvonen and Petri Pirhaven) both of whom played against 'The Rabblers' in the summer tour for HJK Helsinki Supporters' team. The match kicked off in glorious sunshine with both teams evenly matched for the first ten minutes, until some good interplay by the 'Ladyboys' down the left hand side of the pitch produced a snap shot that was well saved by Matt Hammond. Unfortunately the rebound fell to Luca from the 'Ladyboys' who tucked his shot away with ease. The second goal quickly followed again from the same left hand side of the pitch, This time with their centre back moving up the field to finish off a fine move with a thumping shot that gave our Matt no chance. 'The Rabblers' were under pressure at this point, but a came back with a mazy run from young Louis Grater beating three defenders before passing to his fellow striker James O'Shaughnessy. for him to shoot agonisingly just past the right hand post. 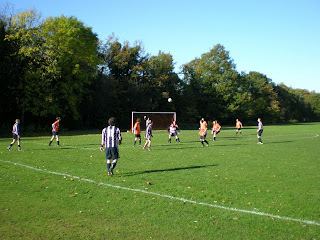 This proved just a fleeting respite as the 'Ladyboys' laid siege to 'The Rabblers' goal forcing a number of corners. 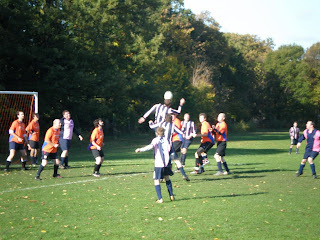 One of which ended with a goal after a goalmouth scramble. 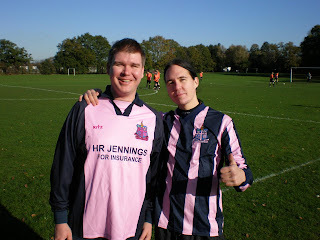 Just before halftime the 'Ladyboys' grabbed two quick goals. Again 'The Rabblers' left hand flank was under pressure with the fourth goal coming from a cracking shot by their forward .Then just two minutes later another raid down the same wing resulted in another shot that flew past Matt Hammond, so the score at half time was 'The Rabblers' 0, 'Ladyboys' 5. The second half started the same way that the first finished with the 'Ladyboys' putting the Dulwich men under pressure from the off. This time though Mattie pulled off some great saves to deny the opposition. Also Larry Marsh and Steve Rickerby at the heart of the defence were putting in some superb last ditch tackles to halt the 'Ladyboy' raiders. 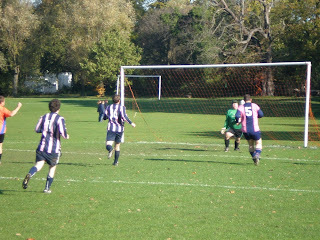 But once more the pressure was mounting , with number six coming from a corner on the left and ending with a close range header which Matt saved but could not stop the ball going over the line for an own goal. The home side were having trouble all match down their left wing and it came as no surprise that the next two goals came from that area. 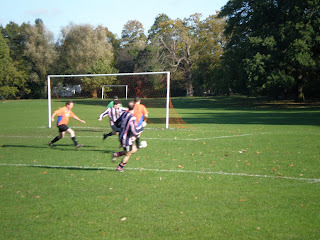 The first from a shot, which was quickly followed by another strike to increase the lead by eight goals to nil. The ninth came with 15 minutes remaining again down the left with some good inter play, ending with a right foot cross and a great volley, to be fair . 'The Rabblers' upped the anti then, refusing to give up, with a good couple of breaks ending with two corners, the first James O'Shaughnessy just missing with a header .The second ended with Dulwich going close with a volley from Louis Grater. But the 'Ladyboys next goal, to reach double figures,came in the last few minutes with a goal mouth scramble before they poked the ball home. 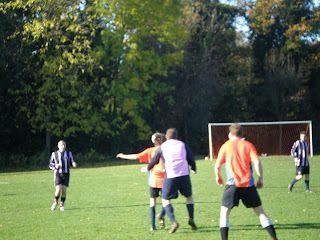 Both teams played with maximum effort but the 'Ladyboys' just had too much for 'The Rabblers'. "I thought the lads we had playing on Saturday did as well as they possibly could. I think the ladyboys were a very strong team. Certainly the strongest team I've ever seen them play. 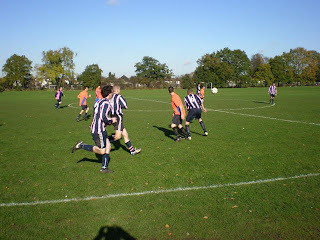 And they scored some seriously cracking goals. But as always when we play the ladyboys, the game was played in a great spirit. And our lads never gave up. Always trying to score at least one goal. It was great to see Sampsa and Petri from HJK Supporters again. 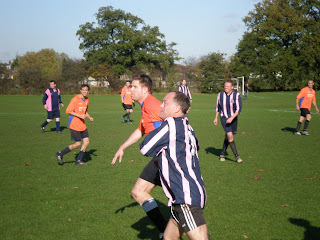 And playing in the pink'n'blue. Maybe the scoreline will lead them into a false sense of security for when they come over to play us next April. 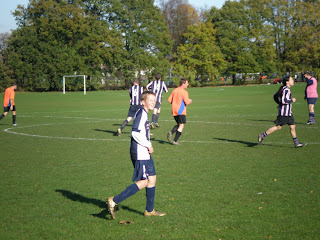 And our American recruit, Brian Joyce, making his debut for us as well, giving a good account of himself. Hopefully, the people who played on Saturday won't be too disheartened and turn up again this week. If nothing else, Saturdays run out should have blown away some cobwebs for a few of us. And next week against Welling, gives us an opportunity to maybe right a few wrongs quickly." 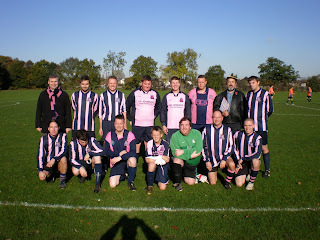 This was the Ladywell 'Ladyboys' squad, followed by ours. Both pictures were kindly taken & supplied by Vikki Grater. Our guest players from Helsinki! We were honured this morning to have two overseas players 'guest' for us this morning, with HJK Helsinki fans Samspa Hirvonen & Petri Pirhaven, (hope we got the names right!) friends we have made on our summer tours, being on holiday in London, with both taking in the afternoon game at Champion Hill as well! Many thanks to Vikki Grater for supplying all the pictures used in this Ladywell section, and also thank you to Tracy Anstey, for uploading them onto this site from Vikki's email, as I had no idea how to do that! Snaps by Vikki, from the game.